Childhood obesity harms 1 in 2 Native American children. This is not news for the Oglala Sioux who live on the Pine Ridge Reservation. But this is news: Their Oyate Teca Youth Center found a sustainable solution to healthy food in a food desert, and a way for youth and families to help. National attention is being focused on the issue of childhood obesity and nutrition. It’s gaining visibility, due in part to President Obama declaring September as National Childhood Obesity Awareness Month and in part to the initiative by Michelle Obama known as Let’s Move! But the exaggerated nature of this risk and the high prevalence of health ills related to nutrition have been a concern of Pine Ridge youth and Elders for decades. Obese children are more likely to suffer from serious, lifelong illnesses like Type 2 diabetes, cardiovascular disease, and asthma than their normal weight peers. This has major implications for lifespan, quality of life, and lifelong health costs. According to Rose Frasier, our longtime Program Partner, this is not the future Pine Ridge envisions for their youth. Rose works at the Oyate Teca Youth Center in Kyle, South Dakota on the Pine Ridge Reservation. Their purpose is promoting the well-being of children and families on Pine Ridge Reservation through effective programs and activities. She and other like-minded community members are taking strong steps toward a different future. They know that obesity is a common symptom of food insecurity — and lack of access to healthy, nutritious food is common in reservation areas, many of which are food deserts. This affects all 400 of the families that Oyate Teca serves. Rose and Oyate Teca came up with a concept to help address this. 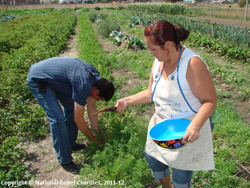 A few years ago, with the help of National Relief Charities (NRC), they established a community garden for youth. It began as a way to involve youth in a healthy activity — and to bring youth and Elders together — but it has evolved into something more. As the garden gained momentum, Rose and Oyate Teca teamed up with the Beginning Farmer and Rancher Development Program to establish a Farmer’s Market. This one market is a concept the whole community is getting behind — it has fostered several other initiatives in the Kyle community. NRC supports the Farmer’s Market by providing garden tilling, seeds, and tools through our AIRC program (American Indian Relief Council). About 50 young families and Elders in Kyle and the neighboring Porcupine community requested garden tilling so they could grow their own fresh produce and teach their grandchildren to plant and tend a garden. Running Strong also tills some gardens in the area. SDSU Extension and the Oglala Lakota College Agriculture Department (OLC) support the Farmer’s Market and community by offering gardening workshops and site training. Oyate Teca and NRC hosted a “Gathering of Gardeners” event to help identify people in the community who wanted to learn basic gardening skills. Already, several people in the community have become certified as Master Gardeners. Lakota Funds helped some families get started with individual gardens that would generate extra produce to sell at the Farmer’s Market creating a new source of income for tribal members. In September, OLC held a produce fair, and many of these gardeners brought in their produce for award ribbons and cash prizes. The fair’s focus was more on traditional Lakota produce such as corn, beans, squash, and local herbs. Oyate Teca youth have started an orchard and will be able to harvest fresh fruit as soon as their trees mature. To support their effort, NRC furnished 16 starter fruit trees — cherry, apple, and plum. Another outgrowth of the Farmer’s Market is a greenhouse where produce can be grown year- round. This greenhouse was funded by an NRC donor. Another first for Pine Ridge, Kyle now has a community canning station. Originally equipped by NRC, the Farmer and Rancher Program, a Chicago youth church group, and an individual donor, the canning station brings family members together to learn how to can and preserve pickles, beets, and other vegetables; make zucchini and banana breads; and create healthy soups that can be canned or dehydrated for later use or sold at the Farmer’s Market. Residents of Kyle and Pine Ridge now visit the Farmer’s Market to purchase produce, homemade canned goods, and baked goods — healthy products that can also be purchased with food stamps. Where previously families had to travel 1-2 hours to Rapid City (SD) or Chadron (NE) to find affordable fresh fruits and vegetables, residents could now buy locally-grown produce close to home. This is a big win! Working through Oyate Teca, Rose Frasier’s dedicated effort has given life to a grassroots effort in the Kyle community, one that’s spreading to Porcupine and other communities on the Pine Ridge Reservation. This is a ground-level success story. We congratulate Rose, Oyate Teca, their collaborative partners, and all of the people of Kyle for finding a healthy, sustainable solution to a lifelong challenge, and for involving youth in the solution and bringing the generations together. Photos Courtesy National Relief Charities (NRC) * All Rights Reserved.